Rugs, Stairs and Concrete: My work simultaneously embodies warmth and sterility to question the notion of absence and how a void emerges only to reveal the presence of something else. My work is an investigation of loss, where the exchange between searching and hiding is continually at play. I am attentive to my own sense of urgency to preserve memory while simultaneously being aware of the impossibility of such an endeavor. Although my work is about mourning and the attempt to compensate for what is lost, art making provides me the opportunity to reimagine the void through an uncanny and sometimes painful confrontation with my own memories. The home is a place that recalls the past; the curve of a railing, the smell of carpet, or the color of light shining through a window perform as bookmarks in our memory. It is a location often cherished and loved by its inhabitants. It embodies the potency of nesting, birth, and safety. When the home experiences any form of adverse change, it has the potential to harbor tragedy. In such moments of augmentation, emotional contradictions occur, where the uncanny emerges through the conflation of both ease and discomfort. Once a place of refuge, the domestic habitat can transform into a complex world layered with haunted memories, projected contrivances, and mundane iteration. 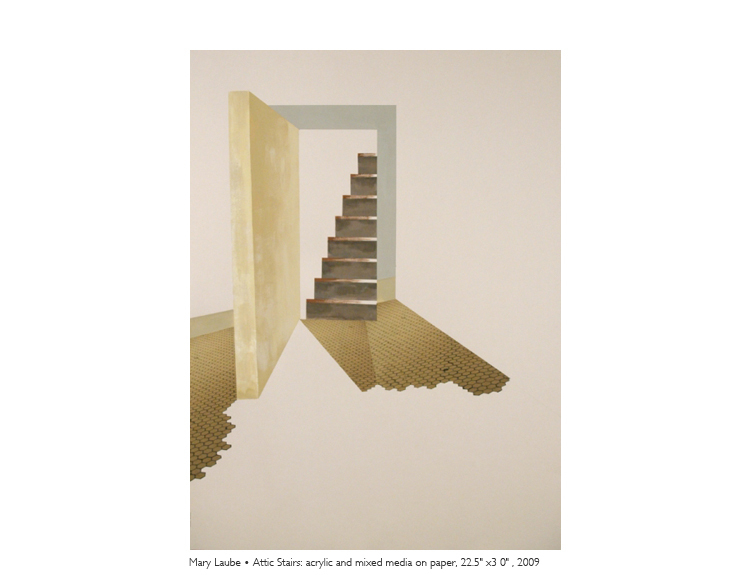 Mary Laube was born in Seoul, South Korea. She completed her M.F.A from the University of Iowa in 2012 and her B.F.A. from Illinois State University in 2009. Her work has been exhibited in places such as Chicago, New York, and Dallas. In 2009 she was the Illinois National Museum of Women in the Arts award recipient and in 2012 she received an artist grant from the Iowa Arts Council. Her work has been published in New American Paintings, Studio Visit Magazine, and has been featured on a number of online publications. Mary is currently the curator at The Times Club: an alternative exhibition space in Iowa City.